John Deere’s new XUV 855D Gator 4x4 utility vehicles are featured on the company’s stand with local dealer Tallis Amos Group (no. D427) at this year’s CLA Game Fair, which is being held at Ragley Hall, Alcester, Warwickshire from Friday 19th to Sunday 21st July. New specifications on the 2013 model XUV 855D Gators include a digital instrument cluster, improved engine braking with a redesigned descent control system, a bigger capacity 55A alternator and a much larger 27.6-litre fuel tank. 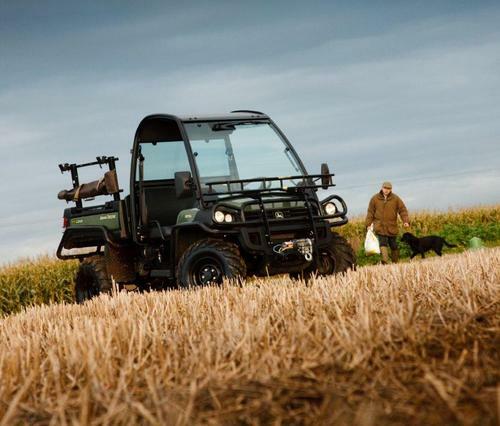 The new electric power-assisted steering (EPAS) system introduced earlier this year is now standard on the XUV 855D Gator with olive & black livery, and optional on the green & yellow version. The Gator’s standard four post ROPS frame can be optionally upgraded to a deluxe full glass cab if required, and further options include alloy wheels, tool carriers and cargo box dividers, a front mounted load rack, a bull bar and side extensions. A rear bumper and horn are now standard.